Not very many universities (as determined by research spend and UCAS points of accepted students) are, in and of themselves, truly distinctive. Employers care more about the usefulness of a graduate to their organisation than the name of the university. Martin Bean, the Vice-Chancellor of the Open University put it more eloquently when he said those universities who believe that content defines their institution are wrong – they are defined by brand, student experience, pastoral care and the means by which institutions enable learning. Not what you do, but how you do it. On the surface, our partnerships with universities in the United States offer pathway programmes, allowing students to articulate into the University – which is correct. However, because we are in a long-term joint ventures with Oregon State University, University of South Florida and Colorado State University, we have been able to formally integrate pathway education into the General Education curriculum. Pathway students are full students of the university. The results speak for themselves . Oregon State University has grown international enrolments at seven times the US average. Moreover, students emerging from the pathway element of the course are performing on a par with US students – and in some cases, outperforming them. The small town of Corvallis has been transformed – and a great state university has generated additional revenue enabling it to invest in 70 tenure track faculty. 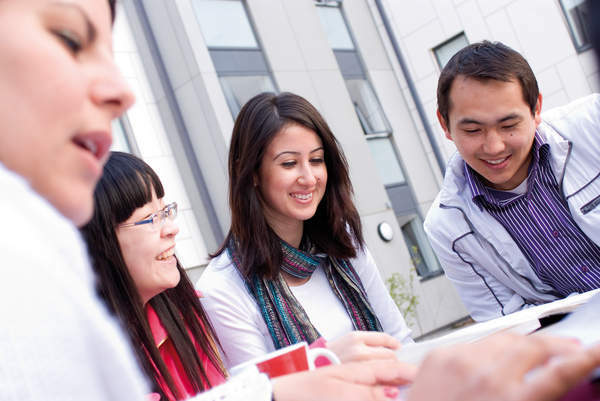 More to the point, the University has a global profile and American students have an enriched perspective on the world brought about by the arrival of so many new students from all over the world. Developing a student experience where results are measured and honing in on what matters to students is more difficult than it sounds. At INTO, we have been with identifying the “ideal” proposition for students and those who advise them. 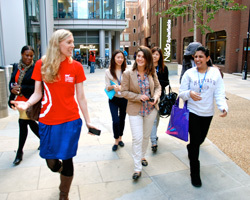 World-class universities, strong degree outcomes, an experience worth sharing with their friends and peers are obvious. Professor Sir Steve Smith and colleagues at the University of Exeter have taken how you do it to an art form. Investing in the student experience, involving students in the process and all supported by a clear vision and strategy has achieved astonishing results – culminating in the richly deserved Sunday Times University of the Year for 2013. At Queen’s University in Belfast, the vice-chancellor, Professor Sir Peter Gregson has produced a video blog on how one university is delivering on an international experience both by welcoming students into the university and providing opportunities for students from Northern Ireland to experience the world through innovative internship programmes and collaborations with private sector organistions from the World Bank to Infosys. The old brand aphorism, that brand is not you say but what others say about you has enabled INTO China in only its second summer of operation, to pick up a student- reviewed award as one of the world’s top ten short study experiences. It is also about getting the basics right, recognising that the experience begins long before the student ever sets foot on campus. In the international market, the speed of response to applications and enquiries is perhaps the one area most students and agents cite as their greatest frustration. All within an institutions gift to influence and shape but one which so many find difficult to execute. Investing heavily in latest CRM technologies and social media channels is important. But without offering speedy response to questions from students sand agents, the ability for parents to converse with staff in their own language, staff in market to demystify the application process – social media can create a Qantas moment and damage rather than strengthen the brand. The technology is just the enabler – ensuring the basics are delivered is even more important. Approaching recruitment and marketing from a slightly different perspective, INTO’s partner universities have access to a recruitment network, spanning 28 countries – producing university promotional collateral in three languages or more. It means extending reach without comprise to core university values.